When i search the net, i found this white and blue floral mermaid ladies dress. It is simple, elegant and very beautiful. 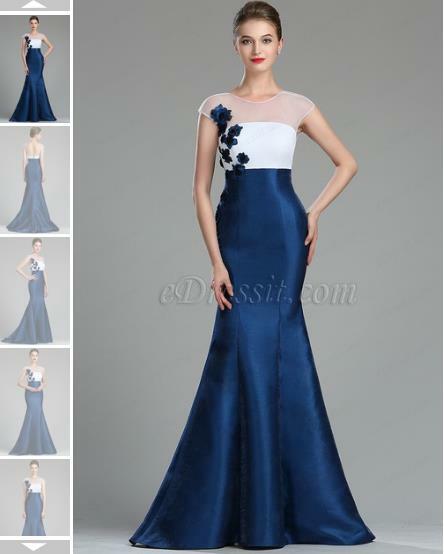 I believe, many of you will like this blue elegant mermaid silhouette dress as the as me. Right? It's made with a sheer neckline that is accented with handmade flowers that stretch down over the right side of the bodice, before falling into a floor-skimming mermaid skirt. Barely there heels will make the perfect evening pairing. If you don't like this type dress, eDressit owns many categories dresses, such as cocktail dresses, 2018 new dresses, little black dresses, etc.